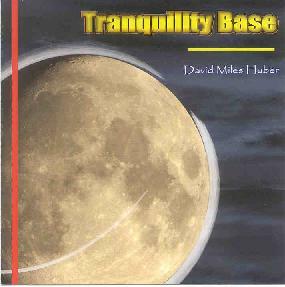 David Miles Huber - "Tranquility Base"
David writes, plays, and produces. 51bpm.com is David’s ambient label, “dedicated to slowing the hectic pace of modern life”. I’m not exactly sure what David plays (musically) to write these tracks, but I’m pretty impressed by what he plays (studio & programming) in order to make this CD happen. This is supposed to be a downtempo, edge of consciousness, relaxing thing. Kind of like a small step above Ambient. It doesn’t really go for the sounds of the formless void or the layered electronics. There are repeating melodic lines, set in a soft angle free background, anchored with (surprise) nice and slow rhythms. The rhythm tracks are very subtle and the treble has been muted a bit so it does have a nicely laid back sound. All the tracks are in the 11-15 minute range and they all develop quite nicely. I should mention that the track ‘Tranquility Base’ is an audio of the actual moon landing, set to music. I’m not a big fan of spoken word set to music and especially not history set to music. I was surprised that it works very well for David. What really helps is that it’s a longer track (16 min), it’s not snippets of the moon landing - it sounds like the whole thing, and the music works like an ethereal soundtrack - always supporting the conversation between the Moon Lander and Houston. It never overpowers (musically) the event. Very Theater-of-the-Mind. I liked this one because it’s a nice change from the ambient I’ve been listening to. Good music and good production values. For more information you can visit the David Miles Huber web site at: http://www.51bpm.com. Contact via snail mail c/o David Miles Huber; 5003 21st Avenue SW, Suite A; Seattle, WA 98106.